We joined the 2016 Artong* Hero event that was held for the second time this year. 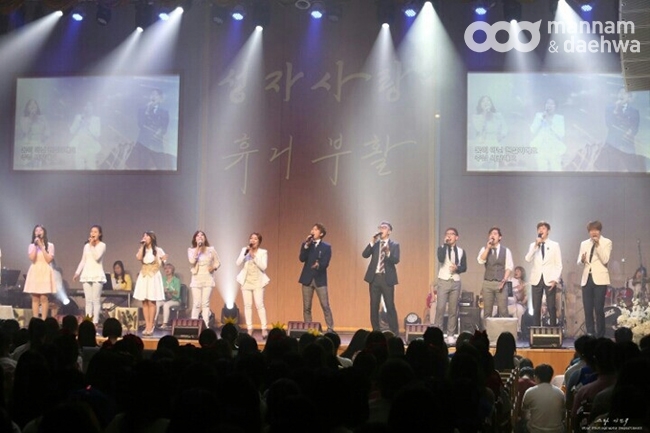 At the end of May, middle school and high school students from each region gathered in Wolmyeongdong. The atmosphere throughout this event was fiery like the sun on a hot summer’s day because of the heat and the passion the students. The Artong Hero event took place in Wolmyeongdong on Saturday, May 28, and was geared towards young middle schoolers and high schoolers. The event was largely successful. 2,400 youths joined the event from all around the country, and among them, 200 people who recently started their life of faith also joined. It was their first time coming to Wolmyeongdong. Many mission posts were positioned around Wolmyeongdong so that as people went from post to post, they were able to enjoy the sight of nature. As people completed each mission, they were rewarded with a star-shaped sticker. Especially, the key feature of this event was the mission posts positioned in different trails starting from the sports field to fit to the purpose that Pastor Jung Myeong Seok regularly emphasizes, “Let’s meet the Holy Trinity deeply throughout the many places in Wolmyeongdong.” Through this, many youths who attended this event had a time to meet the Holy Trinity deeply through nature. The event host team set up the event for people to do more dynamic missions in the sports field, which required them to move their bodies more, while on the other hand, let the people also quietly enjoy the sights of nature on the walking trails. The missions along the walking trails were related to faith, which helped participants meet the Holy Trinity at a deeper level. It was impressive to see how the missions were designed for the youths to approach their life of faith in fun and interesting ways because living a life of faith can appear difficult to them at times and it was impressive to see how the event allowed them to meet the Holy Trinity joyfully as they did the missions. Especially among the posts along the walking trail, parts of Pastor Jung Myeong Seok’s poems dedicated to the Holy Trinity were shown to the participants, and then they had to try to write the rest of the poem in their own styles. This made for a great way to connect faith and even literature. There were a total of 36 different posts posted all around Wolmyeongdong, such as The Wisdom of Daily Life, Overturn Your Bad Components, 99 Second Challenge, Run Carrying Water, The Rhythm in Me, and SaemSaem Pose. For lunch, thanks to the parents who volunteered to make homemade hamburgers and other food, people were able to enjoy it. The homemade hamburgers made a come back from last year due to their tremendous popularity, and in addition to the hamburgers, different kinds of snacks and Geonbbang (hardtacks) that Pastor Jung Myeong Seok prepared showed how much interest and love he has towards the young ones. After all the events regarding the Artong Hero booth were finished, ‘The Provice 11th Showcase Concert with the Artong Hero’ began. The fiery praise offered to the Holy Trinity above all else invoked a stronger and more inspiring response from the congregation as the performance progressed, and some teens even shed tears. The performance included quiet songs that praised the Holy Trinity peacefully and upbeat songs that even teens could relate to. It was a performance that highlighted the harmony of faith with songs. We truly hope to have many people love the Holy Trinity in their daily lives by following the ideology of the Christian Gospel Mission Church: A life of faith is something you should do in your daily life. Faith is not a far cry from life. This was an event that highlighted the Word and the mind of Pastor Jung Myeong Seok of the Christian Gospel Mission Church, which is that one has to meet and love the Holy Trinity during their lifetime.